Subwoofers are a very difficult piece of equipment to master, especially when trying to master it cheap. Low frequencies are very difficult to reproduce, but they can add a lot to an overall listening experience. However, spending a lot of money isn’t the best option, so we ventured out to find the best under $100. We looked for models that are competent enough in the low-end without being over inflated. Adequate power delivery was a must as well, ensuring the speakers don’t distort under the low-end pressure. An efficient design which offers something different and exciting. Slim chassis makes it a very low profile sub. Features plenty of power going through an 8“ transducer. Great set of controls which make it easy to setup. Its niche design limits its application. Most subwoofers on the market these days are fairly conventional. After all that is what most people want. However, there are designs which are different and offer a pretty unique take on what subwoofers can do. 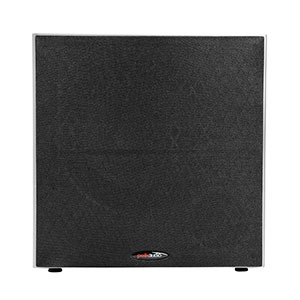 Theater Solutions SUB8SM Slim Subwoofer represents one such option. It is a compact, slim unit meant to be mounted on the wall or floors. Despite its odd design it is still a subwoofer. You are looking at an 8“ high quality, down firing transducer paired with a 250 Watt peak power amp. Frequency range available spans from 35Hz to 150Hz. Aside from digging fairly deep, you also get a full array of controls necessary to properly dial in the speaker to your room’s dimensions. A stylish cabinet which fits into any environment. Good build quality all around. Comes with a 10“ transducer which moves some serious air. A decently powerful amp allows you to experience the bass. Cutoff at 40Hz makes it a bit limited. Polk Audio is one of those brands who need very little introduction when it comes to subwoofers and home theater speakers in general. The model we are looking at today is by far one of the best of its kind in this segment of the market. It is a pretty chunky unit built into a stylish cabinet that looks great. What we liked the most about this model is the fact that it comes with a 10“ transducer. That puts it ahead of 80% of its competition. It is a side firing unit with a side firing bass reflex port. Despite it having a 100 Watt amp inside, it is more than powerful enough for home use that’s for sure. A simple cabinet design that offers that clean look. One capable 8“ transducer in a down firing configuration. Goes pretty deep into the frequency range. Offers a decent amount of clarity. A little bit more power would have been appreciated. 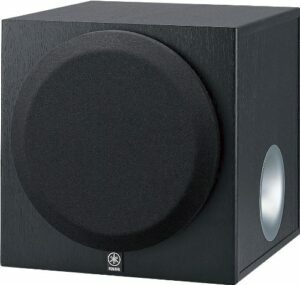 What Dayton Audio SUB-800 offers is a simple solution that will enhance your system’s lower end. One of the most defining features of this particular model has got to be its clean design. It is a down firing subwoofer but it features a clean, stylish cabinet. On top of looking really good, SUB-800 brings you a number of interesting features. 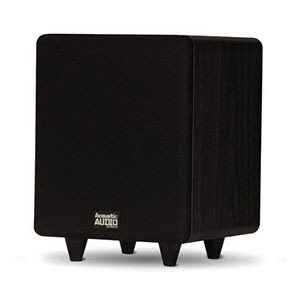 In terms of raw specs, this sub offers 80 Watts RMS with a frequency range of 40Hz to 140Hz. Generally speaking it is neither the most powerful nor the most capable sub in this segment, but it’s among the most reliable. With features such as Auto On mode and a pretty decent selection of controls, it’s too good to ignore. A smaller subwoofer that works great in tight quarters. Great performance with plenty of range. Offers a decent amount of power for its size. Good controls which improve the experience. Loses a bit of clarity once you go super low. Compact subwoofers are often overlooked simply due to their small size. However, more often than not these models are actually quite capable. 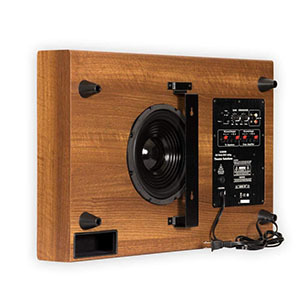 Acoustic Audio by Goldwood PSW250-6 offers a good combination of performance, aesthetics and price. For a sub that was designed specifically for home theaters, it definitely packs a whole lot of juice. At this price, it’s a bargain. Underneath that stylish MDF lies a 6“ low frequency driver linked to a 250 Watt amp. That’s peak power . In terms of the frequency response range, you are looking at 30Hz to 250Hz. In other words, this sub digs pretty deep into the range. Other than that, you have variable LF crossover control, auto shut off and few other features. Designed for use in smaller rooms where space is limited. Features a good set of hardware and controls. Comes with an 8“ subwoofer cone. Good build quality and overall design. Underpowered compared to most of its competition. Yamaha’s audio systems are known for their good performance at reasonable prices. When it comes to subwoofers, they offer one pretty interesting model. It goes under the name of Yamaha YST-SW45 and brings features a great solution for compact home theater setups. Yamaha has found a good balance between power, size and overall sound quality. That alone makes it great. Good build quality and simple design make it quite robust. Features good hardware including a 300 Watt amplifier. Great sound quality thanks to a very capable speaker. Overall good performance for the money. It is missing some of the standard controls. 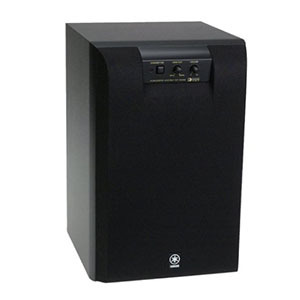 Building a good home theater setup heavily relies on your choice of subwoofers. That is why models such as the Acoustic Audio PSW-8 make all the difference. With this particular model you are looking at great performance that comes in a cabinet not much larger than most. One thing that Acoustic Audio did right was choosing core components over features. The end result is a subwoofer that packs an 8“ cone, a 300 Watts amplifier and a good variable low pass frequency crossover. When it comes to its frequency range, this bad boy digs all the way down to 26Hz and covers everything up to 250Hz. Generally speaking it is one of the absolute best options in this price range. Simple design that is both attractive and reliable. Offers great core hardware and components. Plenty of range for such a small cone. Reaches all the way down to 25Hz with no issues. Feels a bit underpowered compared to most of its competition. Another Yamaha model that is worth mentioning goes under the name of Yamaha YST-SW012. 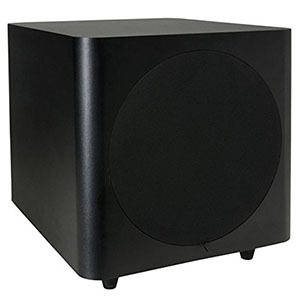 It is a simple, compact subwoofer meant to complete any entry level home theater setup. Yamaha went out of their way to make a reliable, efficient sub that wouldn’t break your wallet. Even though Yamaha YST-SW012 isn’t the latest model in the series, it’s heavily discounted. That alone makes it quite a steal right now. Hardware wise, you are looking at an 8“ cone that features magnetic shielding and a whole lot of range. It is linked to a capable yet somewhat underpowered 100 Watt amp and a decent set of controls. For a front firing model affordable model, this Yamaha sound better than we’ve expected. The first consideration with this price point is, well, the price. When only spending $100 on a subwoofer, it’s clear that a fixed budget is probably in place. Jumping up to $300 or $500 will yield a significantly better result, but that isn’t always in the cards. Because of that, we made sure to hunt down bargains that offered excellent value for the money. The price may suggest that these subwoofers won’t perform well, but $100 proves to be about as cheap as you can go before the value starts to wear off. However, there are some issues. 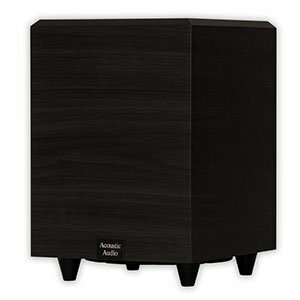 The best subwoofers are ripe with features, including things like subharmonic enhancement, more filter options, and sometimes remote functionality. Those won’t be found on subwoofers under $100, though. Unfortunately, this price point doesn’t warrant much in the way of features. Auto signal sensing and tunable crossover is present on each option, but that really should be expected. Other than that, these just give you the sound they come with. $100 won’t offer much in the way of features, but our options provide just where it counts. Performance is king, and the models that you can find here are no exception. When looking for a subwoofer, astechtics play a huge role. More often than not, an audio set-up is meant for a living or entertainment room, elevating each speaker to the same level as the furniture in terms of design. Because of this, each of are options are understated in the best of ways, ensuring they can fit seamlessly into almost an existing set-up. Neutral colors were essential, trying to shy away from a potential clash in the room. While it may not seem important at first, a small box sitting on your floor that clashes with everything in the room can quickly become an annoyance, which is certainly not the goal. Subwoofers thrive on a larger budget. Making a competent speaker that can compete in the low-end without sounding flubby or distorted is certainly a feat. That feat is even more exemplified with a price under $100. Each of these options prove to provide a solid low-end experience, all for a low price. While a lack of features is disappointing, these propositions give it where it counts – in performance.